Archery Summit Archives - Write for Wine: It's Wine O'Clock Somewhere!Write for Wine: It's Wine O'Clock Somewhere! Seattle’s historic Pioneer Square will soon be the new site of The Estates Wine Room featuring one of our favorite Washington state wines, Double Canyon Cabernet Sauvignon, and Archery Summit Pinot Noir from the Willamette Valley in Oregon. On Dec. 11, Crimson Wine Group will open the new venue with a tasting bar, table seating and an area where you can purchase bottles of wine. Walk-in customers can join in the tastings, purchase wine by the glass, enjoy small bites, as well as food and wine pairings. 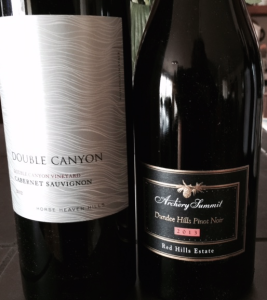 Yes, Double Canyon and Archery Summit will be featured – they are Crimson Wine Group’s northwest holdings. But other wines will also be available. Based in the Napa Valley, Crimson’s diverse collection of luxury domestic estates and wine brands also include Pine Ridge Vineyards (Napa, Calif.), Seghesio Family Vineyards (Healdsburg, Calif.), and Chamisal Vineyards (San Luis Obispo, Calif.). Regular readers know that we have been big fans of Double Canyon since winemaker Jason Ledbetter arrived from Pine Ridge Vineyards, Trefethen Vineyards and Cakebread Cellars in Napa. At Taste Washington 2014, we named Double Canyon’s 2011 Estate Cabernet Sauvignon, from Phinny Hill Vineyard, in our top three favorite wines. A few months later, Double Canyon was included in our list of top 50 Washington wineries in 2014. We hope to see you at the new Estates Wine Room, where you can stock up on party wine right before the holidays!